1. Adjust oven rack to lower-middle position and heat oven to 400 degrees. Grease and flour a 12-cup muffin tin. 2. Beat butter and sugar until light and fluffy. Starting and ending with an egg, alternate adding eggs and flour, beating until each is thoroughly incorporated. Beat in water and vanilla until just incorporated. 3. Spoon two heaping tablespoons of batter into each cup followed by 1 teaspoon of jam (do not stir jam to loosen). Top with 1 heaping tablespoon of batter, spreading to ensure jam is fully covered. 4. Bake until golden brown, about 15 minutes. Remove from oven, let cupcakes stand a couple of minutes; turn onto a wire rack to cool. When ready to serve, dust with powdered sugar. Serve with tea and enjoy with friends! - While Victoria Sponge is typically made with raspberry jam, you can use any jam you like or have on hand. The best jams for putting into the cupcake, however, are harder jams, not the runny, more liquid ones. 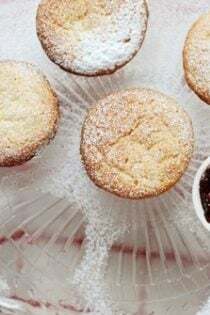 - This recipe calls for self-rising flour, but if you don’t have any, simply whisk 11/2 teaspoons baking powder and 1/4 teaspoon salt into 1 1/2 cups bleached all-purpose flour.